If it is possible, bring the container which contain the arsenic along with the patient who is suspected to suffer from arsenic poisoning. Open the airway, provide ventilation support and monitor the circulation and consider treatment if circulation is compromised. Signs of circulation that are compromised include hypotension. Consider isotonic crystalloid or vasopressor ( refractory cases) in treating hypotension. Cardiac monitor is essential. Observes for any prolongation of QTC interval. QTC interval may be exacerbated by type 1A antidysrhythmics. Neurological treatment may include treatment for seizures and consider thiamine, Naloxone or D5W dextrose for alteration of mental status. Neuromuscular weakness may also contribute for respiratory insufficiency . Assisted ventilation is required in this case. Renal therapy such as hemofiltration is only consider in cases of renal failure and forced urine alkalinization is consider for rhabdomyolysis. Any dermal/skin exposure may require decontamination of the skin. Arsenic will not bind to activated charcoal and is not used. Gastric aspiration/lavage is considered if the arsenic ingestion is within 1 hour. Whole body irrigation is considered if opacities are seen in the right upper abdominal film. Whole body irrigation with 1- 2l/hr of polyethylene glycol is considered until the opacities have vanished. Dimercarpol ( British anti - lewsite) and DMSA ( succimer) are chelating agent that are useful for chelation therapy for arsenic poisoning. The chelating agent is only considered after taking into consideration the advice from toxicology, the symptoms and the level of exposure . Chelation therapy is considered with hemodialysis which is mostly consider for the patient with renal failure ( elimination therapy). Patient who is symptomatic is treated in the intensive care unit. Patient who is asymptomatic will be discharged if spot urinary arsenic level is less than 50 microgram per liters. 24 hour urinary collection and outpatient evaluation are considered if admission is not required and patient is suspected to suffer from chronic exposure . Patient with arsenic poisoning may present with nausea and vomiting unresponsive to antiemetic ( refractory and protracted) , hemorrhagic gastroenteritis ( which is corrosive to the alimentary tract), pain in the abdomen, portal hypertension, stool, vomit, breath ( garlic odor) and acute hepatitis as well as rice water diarrhea. Patchy alopecia, hyperpigmented lesions, erythroderma ( toxic in nature), dermatitis are common dermatological condition . Arrest of growth due to arsenic may lead to development of white band across the nail ( Mee lines). Leukopenia may also develop. Acute rhabdomyolysis and hypothyroidism may occur. Exposure to arsenic gas may lead to hemolytic anemia. Arsenic poisoning carries a high risk of developing skin squamous cell carcinoma, skin basal cell carcinoma, bronchogenic carcinoma and hepatocellular carcinoma. Patient may also present with altered mental status, seizures, paralysis, muscle weakness, sensorimotor neuropathy and acute sensory neuropathy , headache as well as encephalopathy. The symptoms and signs of cardiovascular system are ventricular dysarhythmias, hypotension, non cardiogenic pulmonary edema , non specific changes of the ST segment and prolongation of the QTC interval. The differential diagnosis are Guillain Barre syndrome, shock, hyperemesis gravidarum, heavy metal intoxication, cholera, cyclic antidepressant, Addison’s disease, Korsakoff syndrome and encephalopathy. Full blood count may reveal basophilic stippling ( blood film), leukopenia and anemia. Urea and electrolytes, glucose and creatinine as well as blood urea nitrogen are also considered. Due to short half life ( 2hrs), blood level measurement is not considered. Urinalysis is considered for identification of rhabdomyolysis/hemolysis. Creatinine phosphokinase is also useful for detecting rhabdomyolysis. 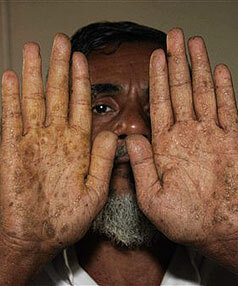 The diagnosis of arsenic poisoning is confirmed with spot urine arsenic level of more than 1000 microgram per liters. 24 hour urinary collection is also considered. Chronicity of arsenic exposure is determined by arsenic level of the hair and the nail. Radiopacity of the foreign bodies are detected on the plain abdominal radiographs. What is arsenic ? There are 3 different form of arsenic. They are known as organic arsenic, inorganic arsenic, elemental arsenic and gaseous arsenic. Inorganic arsenic forms are present in trivalent and pentavalent forms. Pentavalent form may uncouple oxidative phosphorylation reaction. Pentavalent arsenic may also converted into trivalent arsenic. Trivalent arsenic will disrupt the hemoglobin production and bind to sulfhydryl groups. Trivalent arsenic is more toxic than pentavalent arsenic. These inorganic forms are most commonly associated with toxic exposure and cellular poison. The most common causes of worldwide arsenic poisoning are contaminated water and food supplies. This fall under the category of chronic toxicity along with occupational exposure. Besides that acute exposure of sodium arsenate are mostly common due to exposure to ant killer. Intentional ingestion of arsenic are also common cause of arsenic poisoning. This condition usually known as acute toxicity which share similar situation as error in medication prescription or malicious poisoning . Toxicity/ poisoning may also occur due to inhalation of arsenic gas. ( from combustion of arsenic containing compound and zinc). Besides the toxicity effect, arsenic such as arsenic trioxide is useful as part of chemotherapy against acute myelogenous leukemia. Arsenic is also found as anti trypanosomal agent in developing countries ( melarsoprol ) folk remedies ( herbal balls) and home remedies. 1.Tchounwou, Paul B., Jose A. Centeno, and Anita K. Patlolla. “Arsenic Toxicity, Mutagenesis, and Carcinogenesis – a Health Risk Assessment and Management Approach.” Molecular and Cellular Biochemistry 255, no. 1–2 (January 1, 2004): 47–55. doi:10.1023/B:MCBI.0000007260.32981.b9. 2.Hall, Alan H. “Chronic Arsenic Poisoning.” Toxicology Letters 128, no. 1–3 (March 10, 2002): 69–72. doi:10.1016/S0378-4274(01)00534-3. 3.Kannan, Gurusamy M., and Swaran J.S. Flora. “Chronic Arsenic Poisoning in the Rat: Treatment with Combined Administration of Succimers and an Antioxidant.” Ecotoxicology and Environmental Safety 58, no. 1 (May 2004): 37–43. doi:10.1016/S0147-6513(03)00096-4. 4.Kannan, Gurusamy M., and Swaran J.S. Flora. “Chronic Arsenic Poisoning in the Rat: Treatment with Combined Administration of Succimers and an Antioxidant.” Ecotoxicology and Environmental Safety 58, no. 1 (May 2004): 37–43. doi:10.1016/S0147-6513(03)00096-4.